Bike lanes are becoming more and more important throughout the US. They are easily becoming the primary means of transportation in many pivotal cities like New York and Los Angeles. Bike lanes are also popping up on many college and corporate campuses throughout the world. But why is this happening? People are tired of using their cars and sitting through traffic jams that make it very hard to reach work or appointments in a timely manner. Commuting is a lot simpler if you use a LEV (Light Electric Vehicle) and that’s what makes a product like OjO Commuter Scooter well worth the small investment! Why should you purchase this type of e-transportation? There are many reasons why the OjO Commuter Scooter is the perfect LEV for commuters. The primary reason is for convenience because storing the scooter is very easy and charging only requires a 110v standard outlet for the onboard patented cord. The OjO allows you to reach long distances with a speed up to 20 miles per hour for a total of 25 miles before needing to be charged. This means you won’t have a problem getting to work or appointments on time because you can bypass the busy traffic areas. It’s important to note that OjO Commuter Scooter is one of the few electric scooters that allows you to use 3 speed modes that go approximately 7 mph, 15 mph and a top speed of 20 mph which is the legal max speed of the bike lane. The patented 500 watt HyperGear hub motor is designed to bring a lot of power, along with strength and stability through the all-welded heavy gauge extruded aluminum under-chassis. The OjO Commuter Scooter is perfect for commuters since it provides them with the means to pay less for transportation. This is why OjO is for savings. Check out this video to see how easy it is to remove the packaging, turn on your new OjO, connect your phone to the BlueTooth speakers and go! Unboxing Your New OjO Video Combined with the money saved that you would normally spend insurance, a license and on fueling your car or scooter with gas, the OjO takes you a long way at little to no additional cost. It offers up to 25 miles per charge, so you can quickly go to work and return home on a single charge. OjO also offers accessories as well, such as an extra battery pack, mirrors, and a basket. Additional features that many other scooter or bicycles do not provide are strong kickstands, tubeless tires, and a storage hook on every OjO. Charging your OjO is a breeze! If you have 50% battery remaining, it will only take around 2-3 hours to fully charge. If you have zero battery left, it will only take 7-8 hours max before you can hit the bike lane for another 25 miles. The OjO Commuter Scooter does an amazing job removing transportation issues from your daily commute. Since the OjO allows you to easily commute in the bike lane, you get to reach work or your appointments in just half the time. These things combined show how reliable and easy it is to use the OjO Commuter Scooter. 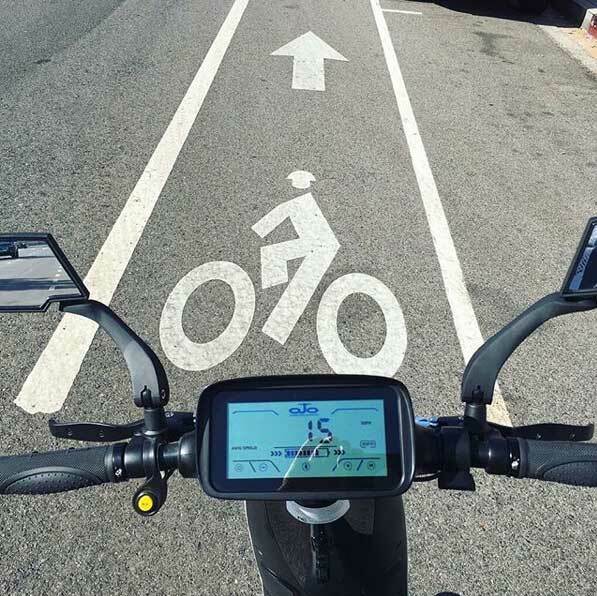 The OjO will save you time and money by providing you with a powerful and easy LEV for the bike lane. What makes the OjO Commuter Scooter a new form of transportation for urban areas? Aside from having high-quality tires, a powerful motor, and an excellent steering system, the OjO also has a powerful LED headlamp, brake lights and handlebar grips. The OjO is great for urban areas since bike lanes have been placed in busy cities to not only help our environment but to help commuters in a faster and smarter way. All of these features provide you with a high-quality commuting experience on a daily basis. The OjO is an incredible, low cost, investment that will help take your daily commuting to the next level!